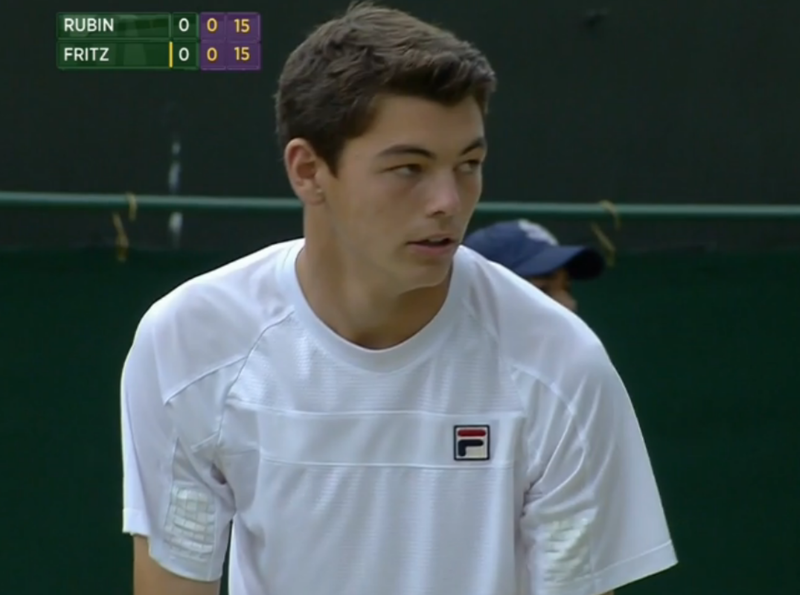 Taylor Harry Fritz is one of America's top prospects to watch in 2015. The 17 year old Californian is coached by his former pro dad, Guy Fritz. His mom, Kathy May Fritz, is a former WTA Top 10 player. 2014 is a break out year in the juniors for Taylor, who has ended the season at No.6 on the ITF Junior Ranking. Continue reading to learn more about Taylor including his game, favorite surface, and plans for the new season. My game style can change around, depending on my opponent, but ideally I like to be as aggressive as possible when I get the chance. Favorite shot would be my serve or forehand. Shot I need to improve the most is backhand volley or backhand slice. It would be Federer because he is the greatest to ever play and it would just be great to be on the court with someone like that. I don't really have any routines I do before a match. I usually just hang out and stay loose. You qualified for a grass event at the G1 Roehampton and advanced to the semifinals, and a week later reached the semis of Junior Wimbledon. Not many juniors get a chance to play on this surface, how was the experience? I was not in qualifying of Roehampton, I was directly in, but grass is such a fun surface to play on especially with my game style. I really enjoyed the opportunity to play at such important tournaments and those two weeks may have been my favorite of the year. Oops, Taylor was right about Roehampton direct entry. Sorry about that, most of the information were off the top of my head when I wrote the questions. You won several big junior doubles titles in 2014 including the Abierto Juvenil Mexicano (w/ Andrey Rublev) and Pan American ITF (w/ Michael Mmoh). What’s your key to success? Partner for upcoming Junior Australian Open? To be honest, I do not consider myself a very good doubles player. I think my key to success is to find a really good partner who can just carry you through the tournament. And I'll be playing with Mmoh again in Australia. Your parents are former pros, did their experience help you in any way? Yes, both of my parents being former pros has helped me incredibly. They both have so much knowledge on the game. I wouldn't be where I am without them. I think the biggest differences between juniors and pros are the physical condition everyone is in and the pros are much mentally tougher. It would be nice if there was hospitality for main draw players like on the Junior Circuit. My dream in tennis is like everyone else's, to be #1 in the world, but taking it one step at a time. First, I would just want to make a living from tennis that I can support myself with. I assume you mean junior tour because those are the guys I know best. I'm not sure, there are a lot of really funny guys. I would have to say it is between Reilly [Opelka], Francis [Tiafoe], Tommy [Paul], Nathan [Ponwith], and Deiton [Baughman]. They are all hilarious guys. Help Taylor decide who is the funniest player? No clue, haven't read a book in years. Don't really have a top five. I don't listen to music that much besides the radio. 2015, I am planning on playing the junior slams and maybe a grade A or two somewhere in there. Possibly, Carson and Easter Bowl because I live right next to both of those tournaments. Besides those, I want to play as many futures and other pro tournaments as possible. Goals this year are mainly to do well at the futures and would like to be top four or five hundred in ATP and do well in the junior slams. Thanks to Taylor for doing the Q&A and good luck in 2015. Happy New Year!